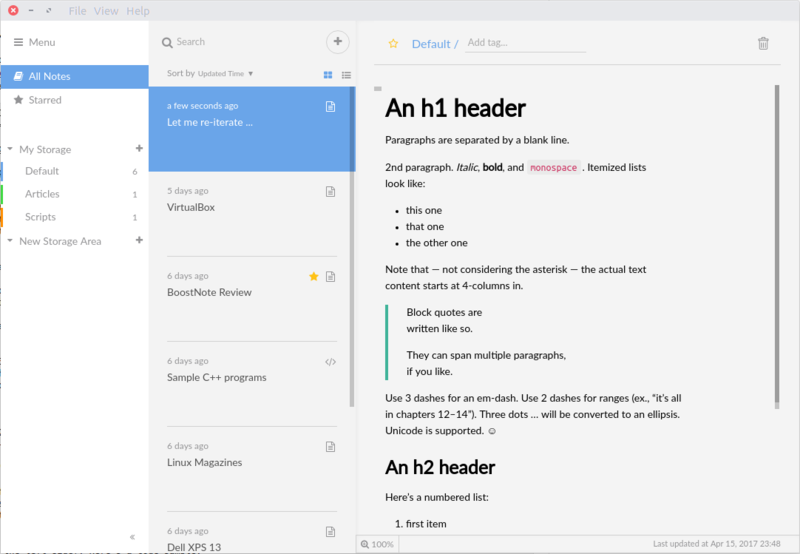 Boostnote is a new Open Source note-taking application focused on programmers. It is available for Linux, Windows and MacOS. It is built on electron and is run offline. As programmers, we usually take down lots of notes that include interesting code snippets, frequently used commands, some scribbles about the project or bug you are working on. And it all becomes more useful if the entire thing is organized in pages. This way, you know where to find the piece of information you are looking for. At work, I have seen most of my colleagues using Microsoft’s OneNote for this purpose. 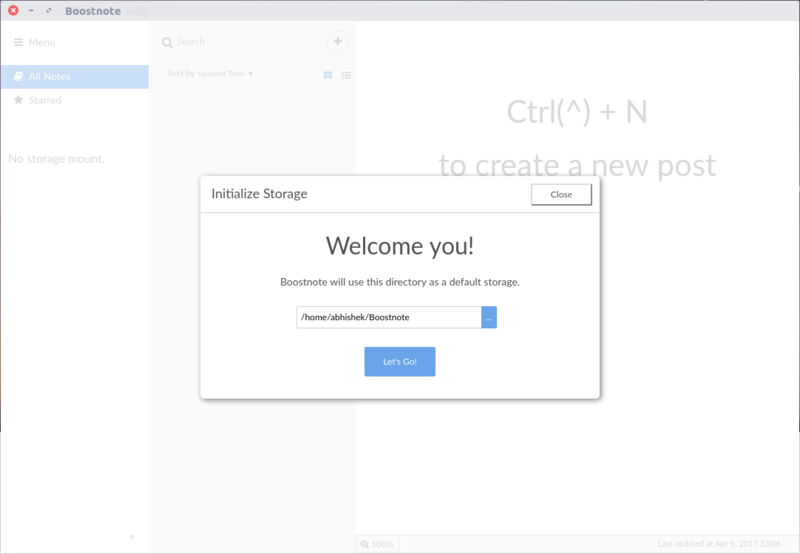 It lets you organize notes in form of pages and chapters. 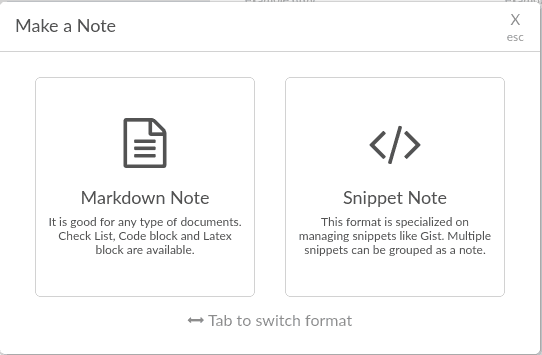 Boostnote is kind of Microsoft OneNote alternative for Linux. However, it doesn’t do everything the same way as OneNote does. We’ll see it in action but before that let me highlight the main features of Boostnote. Notes can be exported to .txt or .md (Markdown). For Arch Linux users, Boostnote is available from the AUR. At first run, Boostnote asks you to define the location of “storage”. Storage is nothing but a directory where all your future notes will be saved. You can have multiple storages allowing you to save different kinds of files in different locations. Otherwise, you can also create notes in plain text. You can create folders to group your notes together. You can also mark notes as favorites to quickly access them from the left side pane. For the snippet, you need to save the file with an appropriate extension in order to get syntax highlighting. You can actually save multiple code snippet files in one Snippet file. In the example below, I have one Snippet note called ‘Sample C++ programs’ that has two C++ programs in it. 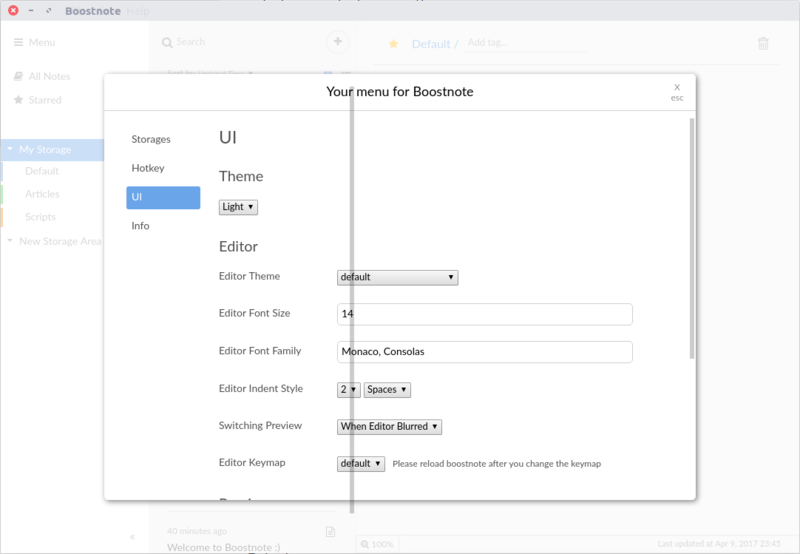 If you do not like the default UI and the editor theme, you can change it from the settings. You can also change the fonts type, fonts size. Settings also allow you to assign custom shortcuts. Remember that the by default the notes are saved in Boostnote’s own file type. You cannot copy the files from the storage directory directly. You can use the export feature to save your Boostnotes in normal text format. Unlike OneNote, Boostnote doesn’t support images. So you cannot save screenshots as part of your note. This is one feature I would love to see in Boostnote in future. Boostnote is a novel concept. Most note taking app doesn’t focus solely on programmers so Boostnote is trying to carve a niche for itself here. 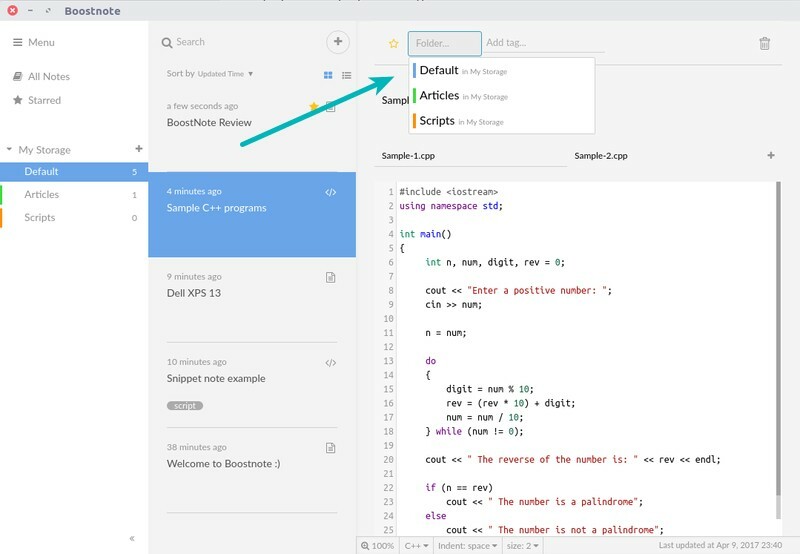 It is not resource-heavy and it fulfills the promise of quickly jotting down notes and code snippets and lets you organize them in a better way. I miss the option of synchronization but I believe it can be achieved by creating a storage area inside the Dropbox folder. 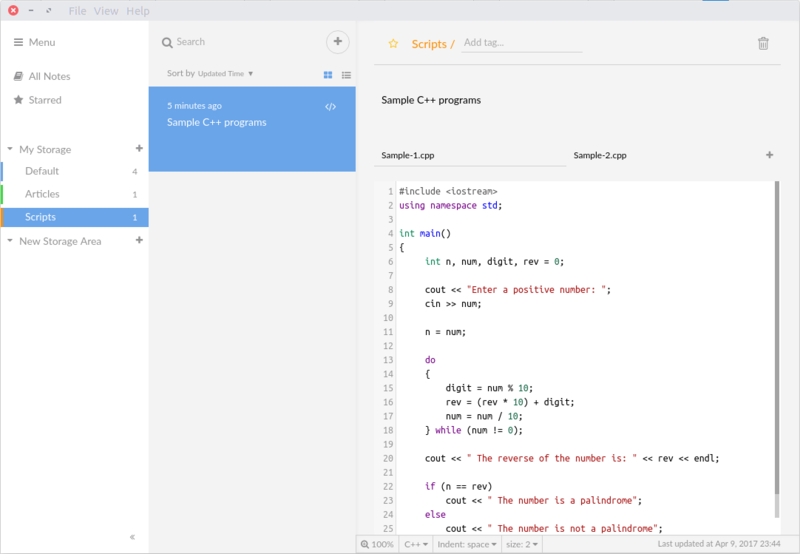 Altogether, Boostnote is a nice open source software that might not be suitable for everyone but programmers might find it handy. Try your hands on Boostnote and see if it fits your need. Don’t forget to share your experience with it in the comment section below. I don’t get what are the advantages with respect to using VSCode (or similar programmer editor) to write markdown files. In addition, I haven’t understood how the user is supposed to handle the history of versions, like Git can do.